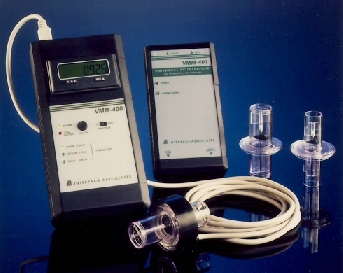 VMM Ventilation Measurement Modules have been discontinued, see now VacuMed's Universal Ventilation Meter. Turbine transducers are available. Turbine transducers are known for their accuracy, stability of calibration and easy interface to a PC based system. Our Turbine Transducers are specifically developed for a variety of precision uni-directional and bi-directional gas flow measurements in the medical and research field. The rugged flow meters are designed for high reliability and simplicity of use. Product benefits include wide measuring range, small deadspace, low resistance to flow, no zero or gain drift, and insensitivity to gas concentration changes. The flow sensors are available in 3 sizes: small, medium and large. The electronic pick-up assembly and the turbine cartridge must be ordered for a complete setup.